Isuzu Philippines Corporation turned over 20 units of their PUV units to one of Pasang Masda’s umbrella organization, the Paniqui Gerona Tarlac Trasnport Services Cooperative (PGT Transeco) on March 15, 2019 in Paniqui, Tarlac. This is in cooperation with the Department of Transportation, Land Transportation Office (LTO), and the Land Transportation Franchising and Regulatory Board. Also present during the turn-over were LTRFRB Chairman Martin B. Delgra III, Almazora president Conrad Almazora, INTECO CEO and President Raymond Jarina and IPC Sales Division Head Joseph Bautista. The new PUV body is compliant with Philippine National Standards, all geared for passengers’ safety and added convenience in fare collection. The new PUVs warranty coverages for cab and chassis is 3 years or 150,000 km, whichever comes first, and separate warranty for body, aircon and accessories, options not available for old jeepneys. LTFRB Chairman Martin B Delgra III commended IPC for their continuous support of the PUV Modernization Program. “This modernization program actually addresses not simply replacing old units with new ones, but also replacing old practices with new modern systems that will make the transport system more efficient, more affordable and predictable. This is what the President has been saying ‘Let’s give the Filipino a comfortable life’,” added Delgra. 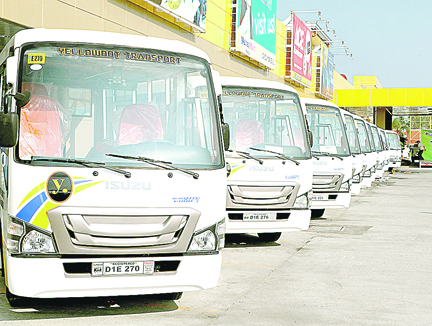 The March 15 turnover is seen as IPC’s headway into the largely untapped modernized PUV market in the province, and the leading Japanese truck manufacturer’s clear show of support for the government’s ongoing Public Utility Vehicle Modernization Program. The PUVMP is envisioned to replace some 250,000 jeepneys nationwide with new, safe and environment-friendly, secure, convenient and comfortable PUVs.